I made this in Northern Ireland and toasted the oats in bacon fat, as chef Paul Rankin said to. The black butter there was amazing. Made from cider apples, it’s also produced in Jersey and you can buy it online. It’s also great with cheese. Heat a frying pan over a medium heat until hot. Add the olive oil and butter, then fry the bacon and scallops for 1-2 minutes, seasoning and tossing every now and then, until crisp and golden. Pop onto a plate and keep warm. Put the pan back on the heat and add the black butter and oats. Stir, season and cook for 1-2 minutes, then top the bacon with this mixture. Put the pan back on the heat and pour in the stock or jus and cider. Simmer over a high heat until reduced by half. Set aside and keep warm. Line a plate with kitchen paper. Put the milk and flour into two separate bowls and season the flour. Dip the shallot rings into the milk, then into the flour and toss to coat. Carefully lower into the oil and fry for 1-2 minutes, until golden and crisp. Lift out and drain on the kitchen paper and season with a pinch of salt. 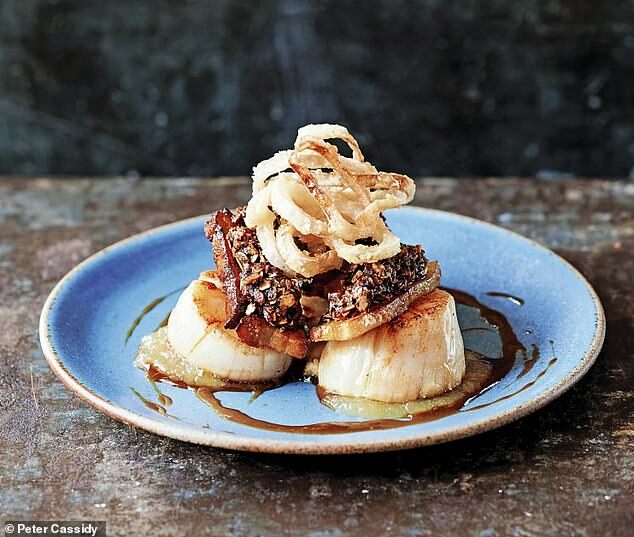 Either pipe or spoon the apple sauce onto 4 plates, top each with 2 scallops, 2 oat-topped bacon slices and onion rings. Drizzle with jus and cider sauce and serve.